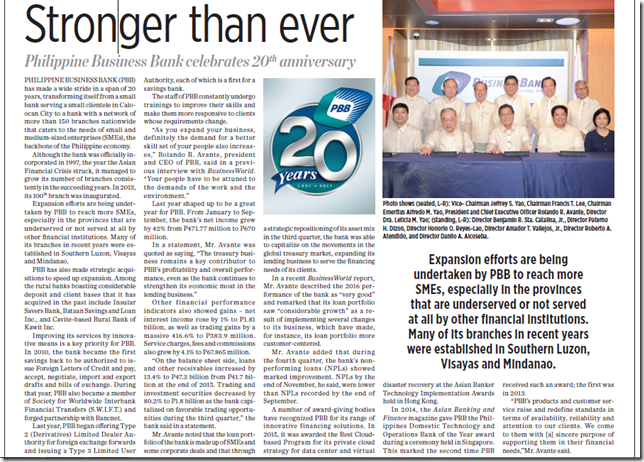 Philippine Business Bank (PBB) has made a wide stride in a span of 20 years, transforming itself from a small bank serving a small clientele in Caloocan City to a bank with a network of more than 150 branches nationwide that caters to the needs of small and medium-sized enterprises (SMEs), the backbone of the Philippine economy. Although the bank was officially incorporated in 1997, the year the Asian Financial Crisis struck, it managed to grow its number of branches consistently in the succeeding years. In 2013, its 100th branch was inaugurated. Expansion efforts are being undertaken by PBB to reach more SMEs, especially in the provinces that are underserved or not served at all by other financial institutions. Many of its branches in recent years were established in Southern Luzon, Visayas and Mindanao. PBB has also made strategic acquisitions to speed up expansion. Among the rural banks boasting considerable deposit and client bases that it has acquired in the past include Insular Savers Bank, Bataan Savings and Loan Inc., and Cavite-based Rural Bank of Kawit Inc. Improving its services by innovative means is a key priority for PBB. In 2010, the bank became the first savings back to be authorized to issue Foreign Letters of Credit and pay, accept, negotiate, import and export drafts and bills of exchange. During that year, PBB also became a member of Society for Worldwide Interbank Financial Transfers (S.W.I.F.T.) and forged partnership with Bancnet. In 2016, PBB began offering Type 2 (Derivatives) Limited Dealer Authority for foreign exchange forwards and issuing a Type 3 Limited User Authority, each of which is a first for a savings bank. The staff of PBB constantly undergo trainings to improve their skills and make them more responsive to clients whose requirements change. "As you expand your business, definitely the demand for a better skill set of your people also increases," Rolando R. Avante, president and CEO of PBB, said in a previous interview with BusinessWorld. "Your people have to be attuned to the demands of the work and the environment." Last year shaped up to be a great year for PBB. From January to September, the bank's net income grew by 42% from P471.77 million to P670 million. In a statement, Mr. Avante was quoted as saying, "The treasury business remains a key contributor to PBB's profitability and overall performance, even as the bank continues to strengthen its economic moat in the lending business." Other financial performance indicators also showed gains - net interest income rose by 1% to P1.81 billion, as well as trading gains by a massive 416.6% to P383.9 million. Service charges, fees and commissions also grew by 4.1% to P67.865 million. "On the balance sheet side, loans and other receivables increased by 13.4% to P47.3 billion from P41.7 billion at the end of 2015. Trading and investment securities decreased by 80.2% to P1.8 billion as the bank capitalized on favorable trading opportunities during the third quarter," the bank said in a statement. Mr. Avante noted that the loan portfolio of the bank is made up of SMEs and some corporate deals and that through a strategic repositioning of its asset mix in the third quarter, the bank was able to capitalize on the movements in the global treasury market, expanding its lending business to serve the financing needs of its clients. In a recent BusinessWorld report, Mr. Avante described the 2016 performance of the bank as "very good" and remarked that its loan portfolio saw "considerable growth" as a result of implementing several changes to its business, which have made, for instance, its loan portfolio more customer-centered. Mr. Avante added that during the fourth quarter, the bank's non-performing loans (NPLs) showed marked improvement. NPLs by the end of November, he said, were lower than NPLs recorded by the end of September. A number of award-giving bodies have recognized PBB for its range of innovative financing solutions. In 2015, it was awarded the Best Cloud-based Program for its private cloud strategy for data center and virtual disaster recovery at the Asian Banker Technology Implementation Awards held in Hong Kong. In 2014, the Asian Banking and Finance magazine gave PBB the Philippines Domestic Technology and Operations Bank of the Year award during a ceremony held in Singapore. This marked the second time PBB received such an award; the first was in 2013. "PBB's products and customer service raise and redefine standards in terms of availability, reliability and attention to our clients. We come to them with [a] sincere purpose of supporting them in their financial needs", Mr. Avante said.